Working with clients with different backgrounds and business visions has constantly inspired us to improve our hosting platform and our business processes alike. Each piece of feedback and every opinion is listened to and discussed in our team; and, if our powers help us, we turn suggestions into features, because we want to make sure we’re building what people really want. We’re always happy to hear from our customers, and for that, we’ll be soon rolling out publicly our product roadmap. But until then, let us share with you one of the nicest customer experiences we’ve had lately. Last November, we were fortunate to welcome aboard a daring Dutch web agency, Pixelstart. What followed was not only a vivid collaboration but also a continuous challenge: we’ve migrated no less than 27 websites to date and still counting! Based in Vlissingen, Pixelstart is an upcoming rockstar internet agency specialized in web design, branding, and development. 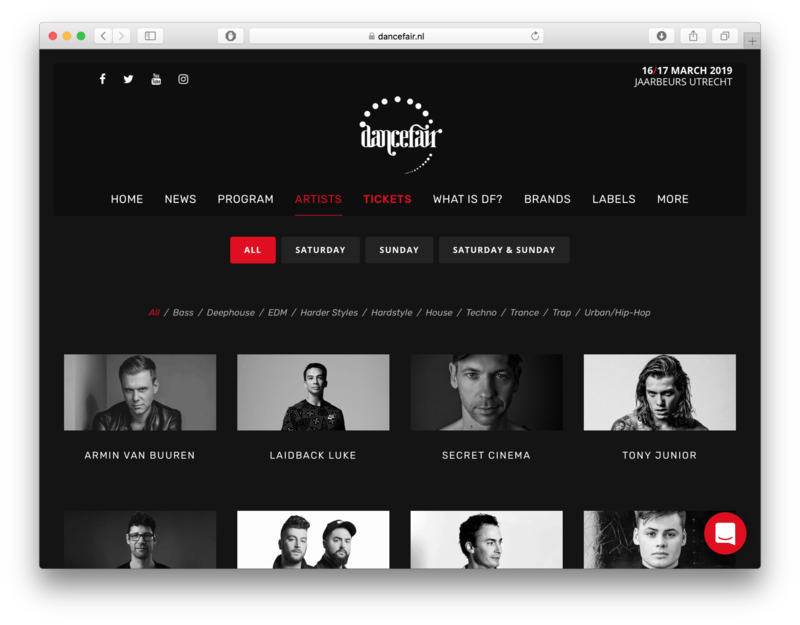 Among the brands in their care, the most well-known are Dancefair, StukTV, and DAY1 Lifestyle. One quick look at those websites, and you can notice the common thread—a tremendous attention to detail. Behind the Pixelstart brand is the 24-year-old Mischa Sigtermans. He started developing sites as a side job while working at a Dutch web hosting company. What’s even more interesting, he’s also a part-time DJ, and somehow manages to grow his agency and playing and composing music, too. Looks like work and fun do go hand in hand. A pixel-perfect design is paramount. I started looking around on the Internet since I was not capable of building my own setup and wanted a powerful, redundant, multi-node setup. I’ve tested several platforms: Pressidium, WP Engine, Pressable, Kinsta and a few others. All of them were missing some sort of features I needed, except for Presslabs. I had contact with the Presslabs team, I sent some website exports over through our Nextcloud server. He just asked on which domain the site needed to go and if it was a live or a dev site. 10 minutes later the site was already good to go. We did some tests to see if everything ran well, and that was really it. Our infrastructure is created to welcome publishers, agencies, and enterprises, and each category of customers has a different set of key features to accommodate their websites’ needs. For agencies, we designed the development workflows around git, added new site management tooling such as certificates and a DNS editor, and implemented straightforward troubleshooting features for performance hog detection and error logging. In my opinion, Presslabs is by far the best managed WP hosting provider out there. Their blazing-fast hosting combined with outstanding skilled support is an absolute killer for all other providers. The intuitive dashboard, contact with the team, outstanding support, fast migrations, all features within the dashboard, git support and of course the blazing fast hosting with great caching. The caching is just really good and I love the fact that this setup is multi-node with one dedicated node for the back-end. Our aim is to have 100% uptime and as low as possible response time to improve site performance, which will directly impact SERP and conversions. That’s exactly what we did with the Pixelstart’s sites, too. We’ve already said that Pixelstart is a prodigious team to work with, so now we’ll use our experience with migrating and managing their clients’ websites to exemplify how our managed WordPress hosting platform has benefited them. Dancefair is a website that serves as an educational event for people who want a future career in the dance industry. One of the demanding aspects of this site was the amount of media that needed to be loaded on the Artists page. To make it faster and easier, we loaded the images from our WordPress-centric CDN, which had a significant impact on the Artists page loading. We wanted to handle things a little different regarding this case study. Showcasing the change in numbers right after the migration of sites was a top priority. Mischa supplied us with two additional sites to migrate to our platform. We conducted the initial tests on those sites, to see how they perform with the hosting provider at the time. Following the migration, we re-tested them, to see the differences in performance. We used Pingdom for the testing process. We’ve been extensive users of Pingdom for our internal monitoring until we switched to StatusCake. However, Pingdom’s testing tool still is the handiest way to ask for a third-party opinion on site performance. The first site that we tested was an e-commerce site. 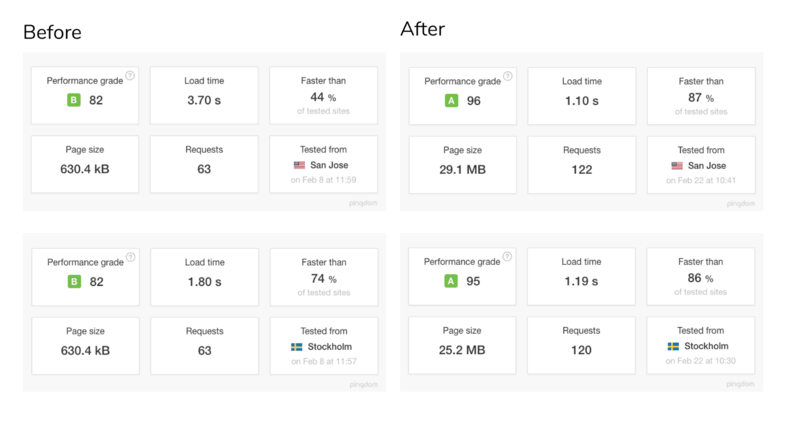 From both the San Jose and Stockholm test sites we saw, after the migration on our WordPress platform, a better performance grade and an average decrease in load time of about 50%. 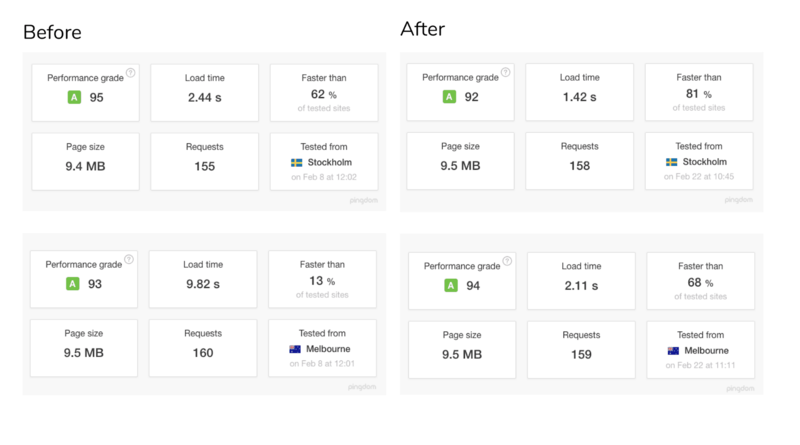 For the second site we tested, we have achieved an average decrease in load time of about 60%, from both the Stockholm and Melbourne test sites. We have to mention that this change happened immediately after the migration. Our relationship with Pixelstart has been so far a great journey, and we’re grateful to be assisting their growth. We will host all our forthcoming WordPress websites on Presslabs. All our feedback and feature requests are taken into consideration which we really appreciate and why we certainly stay with Presslabs. 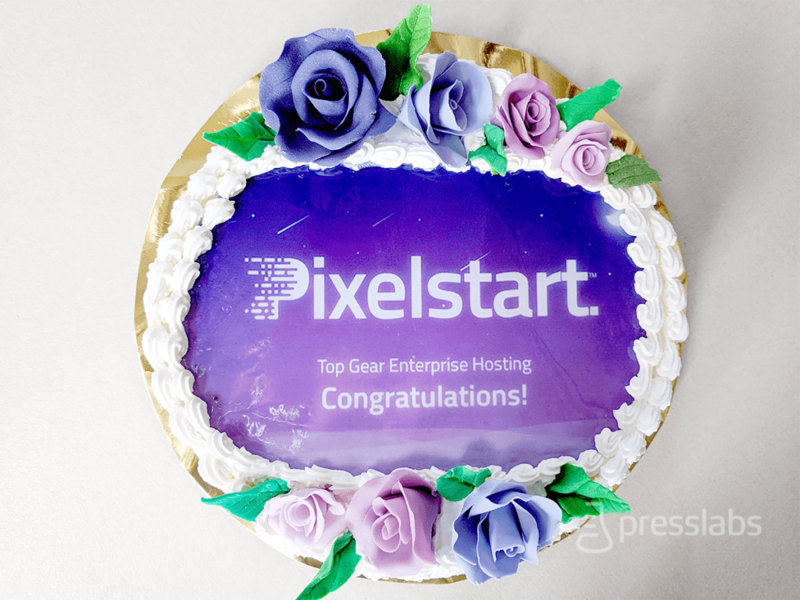 And to top it off, they made us a sweet surprise on the occasion of earning our place in the Top Tier Enterprise WordPress Hosting of 2018. The cake is gone, but if you wanna give Presslabs a try, drop us a line at ping@presslabs.com.